North Rhine-Westphalia, usually shortened to NRW, is the westernmost, the most populous, and the economically most powerful state of Germany. The state was formed in 1946, by merger of two historic and rather distinct territories of the Free State of Prussia: the Rhine Province and the Province of Westphalia. 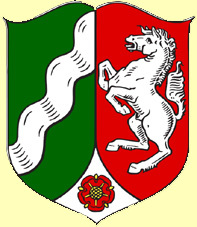 The former Free State of Lippe was joined in 1947. North Rhine-Westphalia is situated "deep in the West" of Germany and includes the plains of the Lower Rhine region and parts of the Central Uplands (Mittelgebirge) up to the gorge of Porta Westfalica. The state comprises a land area of 34,083 km² (13,158 square miles) and shares borders with Belgium in the southwest and the Netherlands in the west and northwest. It has borders with the German states of Lower Saxony to the north and northeast, Rhineland-Palatinate to the south and Hesse to the southeast. North Rhine Westphalia has a population of approximately 18 million inhabitants, and is centred around the polycentric Rhine-Ruhr metropolitan region, which includes the formerly industrial Ruhr region and the Rhenish cities of Bonn, Cologne (Köln) and Düsseldorf. 30 of the 80 largest cities in Germany are located within North Rhine-Westphalia. The state's capital is Düsseldorf, the state's largest city is Cologne. As the most urbanised federal state in Germany, North Rhine-Westphalia possesses the country's highest density of cultural, educational and research institutions, the densest transport infrastructure and the highest number of multinational cooperation. North Rhine-Westphalia contributes about 22% to Germany's gross domestic product and accounts for about 28% of the country's foreign direct investments. Around 11,500 foreign companies from the most important investment countries control their German or European operations from bases in North Rhine-Westphalia. This means that almost a quarter of the foreign companies in Germany are domiciled in North Rhine-Westphalia. These include many international global players such as 3M, BP, Ericsson, Ford, LG Electronics, QVC, Sony, Renault, Toyota, and Vodafone. The companies employ a total of over 582,000 people. Their activities range from pure production to sophisticated services. The cosmopolitan cities of the Rhineland have always been centres of culture, trade and commerce. The Ruhr region, formerly known as the "land of coal and steel" (Land von Kohle und Stahl), has - since the 1960s - undergone a significant structural change away from coal mining and steel industry. Many rural parts of Eastern Westphalia, Bergisches Land and the Lower Rhine ground their economy on "Hidden Champions" in various sectors. The state of North Rhine-Westphalia was established by the British military administration on 23 August 1946. Originally, it consisted of Westphalia and the northern parts of the Rhine Province, both formerly part of Prussia. In 1947, the former state of Lippe was merged with North Rhine-Westphalia, hence leading to the present borders of the state. The constitution of North Rhine-Westphalia was then ratified through a plebiscite. The most important rivers flowing at least partially through North Rhine-Westphalia include: the Rhine, the Ruhr, the Ems, the Lippe, and the Weser. The Rhine is the by far most important river in North Rhine-Westphalia: it enters the state as Middle Rhine near Bad Honnef, where still being part of the Mittelrhein wine region. It changes into the Lower Rhine near Bad Godesberg and leaves North Rhine-Westphalia near Emmerich at a width of 730 metres. Almost immediately after entering the Netherlands, the Rhine splits into many branches. Cologne is Germany's fourth-largest city (after Berlin, Hamburg and Munich), and is the largest city both in the German Federal State of North Rhine-Westphalia and within the Rhine-Ruhr Metropolitan Area, one of the major European metropolitan areas with more than ten million inhabitants. It is one of the oldest cities in Germany, having been founded by the Ubii in the year 38 BC. The name is derived from that of the Roman settlement, Colonia Claudia Ara Agrippinensium. Cologne is located on both sides of the Rhine River. Modern Düsseldorf is an important international business and financial centre and also renowned for its fashion and trade fairs. Culturally, as a city by the River Rhine, Düsseldorf is a stronghold for Rhenish carnival celebrations. Every year in July more than 4.5 million people visit the city's Largest Fair on the Rhine funfair. Even though only the seventh most populous city in Germany by population within city limits, Düsseldorf is one of the country's five global cities. The Mercer's 2009 Quality of Living survey of cities with the highest quality of life ranked Düsseldorf sixth worldwide and first in Germany. After Frankfurt and Munich, Düsseldorf International Airport is Germany's third largest commercial airport, with 18.6 million passengers annually. The airport offers 180 destinations on 4 continents, and is served by 70 airlines. The airport buildings were partly destroyed by a devastating fire caused by welding works in 1996, killing 17 people. It was completely rebuilt and the Skytrain installed. Dortmund is located in the Bundesland of North Rhine-Westphalia, in the Ruhr area. Its population of 587,830 (in June 2005) makes it the 8th largest city in Germany and the 34th largest in the European Union. The Ruhr river flows south of the city, and the small river Emscher flows through the municipal area. The Dortmund-Ems Canal also terminates in the Dortmund Port, which is the largest European canal port, and links Dortmund to the North Sea. Dortmund is known as Westphalia's "green metropolis." Nearly half the municipal territory consists of waterways, woodland, agriculture and green spaces with spacious parks such as Westfalenpark and the Rombergpark. This contrasts with nearly a hundred years of extensive coal mining and steel milling within the city limits. Dortmund Airport is a medium-sized, but quickly growing airport 13 km (8 miles) east of the city centre at the city limit to Holzwickede. The closest intercontinental airport is Düsseldorf International Airport. 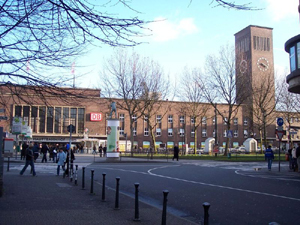 The central train station (Dortmund Hauptbahnhof) is the third largest long distance traffic junction in Germany. 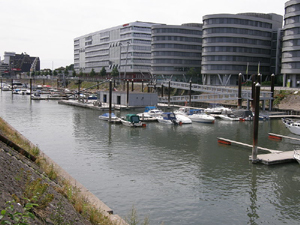 Dortmund Harbor (Hafen) is the largest canal harbour in Europe; almost as large as the harbor on the Rhine River at Duisburg, the world's largest inland port. 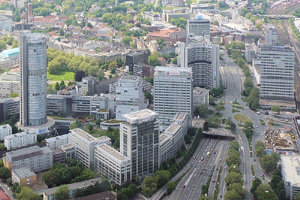 Essen is located in the centre of the Ruhr area, one of the largest urban areas in Europe (see also: megalopolis), comprising 11 independent cities and 4 districts with some 5.3 million inhabitants. 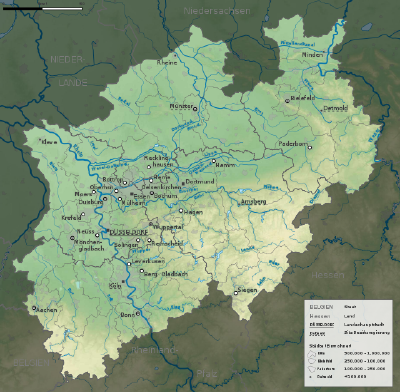 The city limits of Essen itself are 87 km (54 mi) long and border 10 cities, 5 of them independent and 5 kreisangehörig (i.e., belonging to a district), with a total population of approximately 1.4 million. 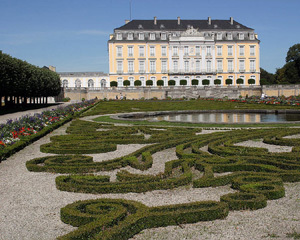 The city extends over 21 km (13 mi) from north to south and 17 km (11 mi) from west to east, mainly north of the River Ruhr, which forms the Lake Baldeney reservoir in the boroughs of Fischlaken, Kupferdreh, Heisingen and Werden. The lake, a popular recreational area, dates from 1931–1933, when some thousands of unemployed coal miners dredged it with primitive tools . Generally, large areas south of the River Ruhr (including the suburbs of Schuir and Kettwig) are quite green and are often quoted as examples of rural structures in the otherwise relatively densely populated central Ruhr area. The lowest point can be found in the northern borough of Karnap at 26.5 m (86.9 ft), the highest point in the borough of Heidhausen (202.5 m/664 ft). The average elevation is 116 m (381 ft). Today's city is a result of numerous incorporations of surrounding towns and smaller cities. It is the fifteenth-largest city in Germany and the fifth-largest city in North Rhine-Westphalia with 495,668 residents as of 31 December 2007. The city is renowned for its steel industry. The last remaining coal mine closed down in the Summer of 2009, but Duisburg has never been a coal-mining center to the same extent as other places in the Ruhr. All blast furnaces in the Ruhr are now located in Duisburg. 49% of all hot metal and 34.4% of all pig-iron in Germany is produced here (as of 2000). It also has a large brewery, the König Brauerei, which makes the König Pilsener brand. 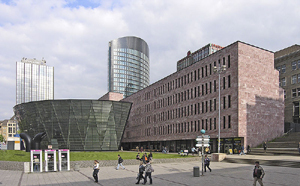 The University of Duisburg-Essen, with 33,000 students, ranks among the 10 largest German universities. This city holds a close place for my wife as her father was born in Homberg am Rhein and it was annexed to Duisberg several years ago. On a recent trip to Germany we took the time to locate her father's birth house which was about a 1/2 block from the Rhein river. The home was just as a photo from her father baby book except for some modifications to the rear for a car port.